I know people have babies all year round, but for some reason there is a huge surge in interest for baby cards in the Spring! 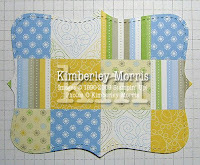 So, I have a few to share, and a pattern so that you can make your own baby cards. Click HERE to download ONESIE CARD PATTERN. Of course, these make awesome baby announcements and baby congrats cards, but you could also make up a bunch to give to a new mom as 'thank you' cards for baby gifts, or they would be great for baby shower invitations. 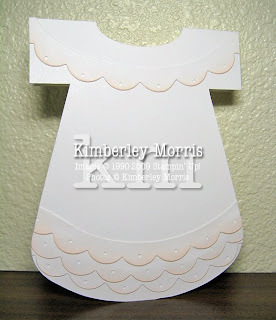 Use the gown version of the pattern for a christening...it could even be tweaked to make a little paper angel! Since you can print out the pattern, you could reduce the size of the onesie and cut some of them out for scrapbooking pages, or to put multiple onesies on the front of a card for twins, triplets, etc. The gown even makes a cute little dress that could be used as an invitation to a little girl's victorian tea party. I have posted three different samples made with this pattern, so you can see that you can make a very simple and quick card (handy for making sets as gifts), or you can take your time and doll it up for a unique and memorable event. Blue/White Onesie Stampin' Supplies: Family Phrases stamp set, Bashful Blue card stock and ink, Whisper White card stock, Brocade Blue ink, Stampin' Sponge (to highlight bib and flap with Bashful Blue ink), Sizzix Ovals Die (largest oval makes bib and medium oval makes flap), Large Oval Punch, Scallop Oval Punch (NEW-Order it beginning April 1st! ), 1-3/8" Circle Punch, Scallop Circle Punch, Square Scallop Punch, Metallic Eyelets (silver), Crop-A-Dile (to punch holes and set eyelets), Paper Snips (for cutting out the pattern). White Gown Stampin' Supplies: Whisper White card stock, Large Oval Punch, Scallop Oval Frame Sizzix Die (snip into parts to create lace), Blush Blossom ink, Stampin' Sponge (to sponge ink on ends of lace for highlights), 1/16" hole punch (to make holes in scallops for "lace"), Paper Snips (for cutting out the pattern). This card is a lot easier to make than it might look. 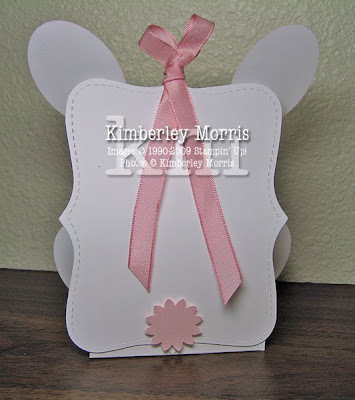 First, you will want to cut a piece of scrap card stock or paper to 5" x 3-3/4". 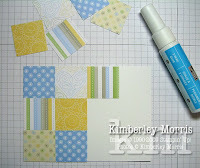 Then, you will take your 1-1/4" Square Punch, and punch out 12 squares of coordinating card stock or patterned paper. 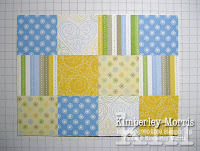 Arrange and adhere the punched squares onto your scrap piece, as shown below--all 12 pieces should fit perfectly, so use the corners and sides of the scrap piece to line them up next to each other. You can use SNAIL, but I prefer to use the Two-Way Glue Pen to get into the corners of each piece and make sure they are glued all snug and flat. Next, you will place your scrap piece with the glued squares, FACE DOWN on the Top Note Die. (I think the perforated detail on the Top Note looks nicer if you put the piece face down) The pictures below show the Top Note Die on the left, then the scrap piece with the glued squares face down over the cutting outline of the Top Note Die on the right. It's a little hard to see in the photographs, but the idea I wanted you to get is that you will need to make sure your scrap piece with the glue squares covers the cutting outline of the die. Run your Top Note Die through the Big Shot machine to get the trimmed "quilt" piece. You can also run your quilt piece through a Texturz Plate on the Big Shot, if you'd like to add a bit more depth. 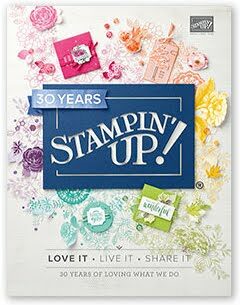 I ran mine through the diamonds pattern of the Stampin' Up!® Backgrounds I Texturz Plates. You can also optionally add little "stitch" marks or "faux quilt ties" between your squares, as I did in the picture below on the right, with a Chocolate Chip marker. Finally, I sponged around the quilt piece with Chocolate Chip ink and a Stampin' Sponge, to set it off a bit from the base card (which I also textured using the Big Shot), and added a greeting. Isn't he cute??? I'm going to post a tutorial when I'm feeling better...hopefully in the next couple of days...so please stay tuned! If you're one of those advanced stampers who can figure most of it out yourself, take a peek at THIS POST for some tips on assembly, and for dimensions for the box portion of this project! Stampin' Supplies: Top Note Sizzix Die, Whisper White card stock, Pink Pirouette card stock, Basic Black card stock, Wide Oval Punch, Large Oval Punch, Scallop Punch (take a "bite" out 3 scallops worth of this, with the Wide Oval Punch, to get one front paw), Boho Blossoms Punch, 1/2" Circle Punch, 5 Petal Punch ("bite" off the end of one petal with either the 1/2" Circle Punch or the Wide Oval Punch, to get the nose), Pink Pirouette ink pad, Stampin' Sponge, Sponge Daubers (to color cheeks), Basic Black marker, Pretty in Pink Tafetta Ribbon, 1/16" hole punch, Silver brads, white gel pen, Sticky Strip, SNAIL, Mini Glue Dots (recommended for easier assembly). This is a little box I've had sitting around for a while, and just never posted. I've made these with snowman designs, with a peek-a-boo hole for white tic tacs to show through, and in halloween designs with a peek-a-boo hole for orange tic tacs to show through. 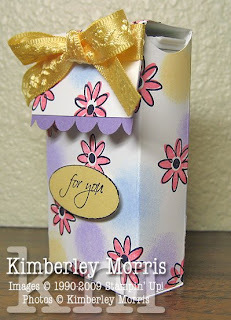 Today I thought I'd make a dainty, flowery, spring-themed box...these are great purse gifts, and are easy projects to make for a class, or to sell at craft fairs. Download Tic Tac® Big Pack Box Pattern HERE. 1) You can punch peek-a-boo holes in the box for the tic tacs to show through, but you might need to fold a side or bottom flap in half to get your punch far enough in. And, if you do a peek-a-boo hole, use scratch paper to figure out where you want it before attempting it on your card stock box. 2) If there is a date stamp across the clear plastic tic tac container where you want the candies to show through, wipe some StazOn ink remover over the date stamp and it should come off easily with a paper towel. 3) Using velcro to close the box is ideal, as it is easy to open and refasten, and keeps the integrity of the box decoration. The box can also be refilled with a new container of tic tacs whenever necessary. 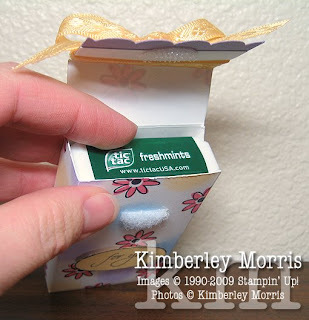 4) You'll want to use Sticky Strip to keep the box from falling apart--especially if it ends up in a purse! Stampin' Supplies: Holiday Blitz stamp set, All Holidays stamp set, Whisper White card stock, Lavendar Lace card stock, So Saffron card stock, Sponge Daubers, Bashful Blue ink, Lavendar Lace ink, Apricot Appeal ink (or you could use So Saffron, but the apricot is brighter), Basic Black ink, Regal Rose ink, 3/4" Circle Punch, Scallop Edge Punch, Small Oval Punch, Ribbon Originals Dress Up, Stampin' Dimensionals, Velcro®. 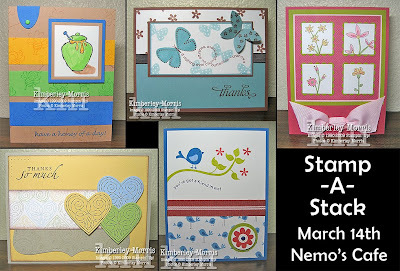 Purchase the kit to make 15 cards & envelopes - includes 5 full color instruction sheets (PDF via email), plus card stock, embellishments and envelopes. You provide your own stamps and ink for this option. Also, you will receive a one-time coupon for 10% off any order placed within 30 days of your kit purchase, which includes stamp sets or ink needed to complete the projects. Orders will be accepted through March 27th, or while supplies last. I couldn't help myself--I had to make this leprechaun box...I love how it turned out! TO CREATE THE INSIDE BOX: It takes two Garden Green card stock Top Note die cuts, one Blush Blossom Top Note die cut, and a half sheet of letter sized Garden Green card stock (trimmed to 5-1/2" x 6") for the box in between the Top Notes. The trimmed sheet gets scored 1-1/4" in from the left and right, along the 5-1/2" side, and scored 2-1/8" in from the left and from the right, along the 6" side. Snip along all four of the score lines on the 6" sides, up to the 1-1/4" score line, then fold sides in and adhere to create an open-topped box. 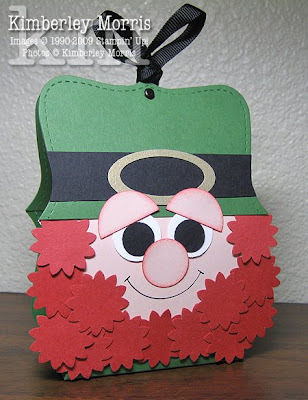 You'll also need a good sized piece of Ruby Red card stock and the Boho Blossoms Punch for the beard. The rest of the features and decoration can be created with some scrap pieces of Basic Black card stock, Whisper White card stock, Blush Blossom card stock, and Metallic Gold card stock. One of the Garden Green Top Notes will be cut exactly in half. One half is used in front for the hat, the other half is glued onto the inside of the back Top Note. You will sandwich ribbon between these Top Note pieces, to hold the ribbon in place. I also recommend using a brad through each of the Top Notes, at the top center, going through all layers and ribbon to reinforce them. The hat band is 3/4" wide, and trimmed to the Top Note side after it is adhered. 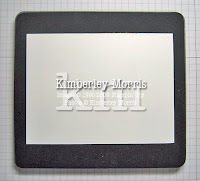 The buckle is made by first punching the Small Oval Punch through Metallic Gold card stock, then centering the Large Oval Punch around the smaller hole, and punching it out. The eyelids are made from a 1" punched circle, cut in half. The whites of the eyes are 3/4" punched circles, and the pupils are 1/2" punched circles. The nose is a 3/4" punched circle. Eyelids and nose were sponged around the edges with Ruby Red ink. 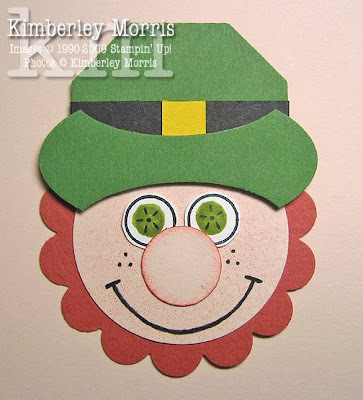 To make a template for the smile, punch a 1-3/8" Circle out of scrap card stock or vellum card stock, and trace along the inside of the punched hole to create a uniformly curved smile. You can add some freckles (dots) to his cheeks with a Basic Black marker, and a glean in his eyes with a white gel pen, if you'd like. I used Mini Glue Dots to attach the punched beard flowers, and the facial features. I used Sticky Strip to attach the box to the Top Notes. I used liberal amounts of SNAIL on both surfaces to attach the 1/2 Top Notes to the full Top Notes (for the hat and the top back supporting piece). It takes about 14 of the largest Boho Blossoms Punch flower to cover the Top Note. Instead of punching flowers for the beard, you could sponge Ruby Red ink around the beard area at the bottom and sides of the Blush Blossom Top Note, but I thought the flowers added a lot of character. WARNING: during the creation of this project, your eyes may turn Garden Green, and your hair may turn Ruby Red. If you already have those features, then expect to gain a few more freckles on your nose by the time you're done! So I have this group of leprechauns on my table, and I didn't know what to call them. I was thinking along the lines of "flock", or "gaggle", or "pod", or maybe even "tribe"...but then I figured these cunning little creatures must have a LAIR! Plus, the term 'lair' is quite alliterative, so I'm stickin' to it! Punch out a Scallop Circle from Ruby Red card stock. 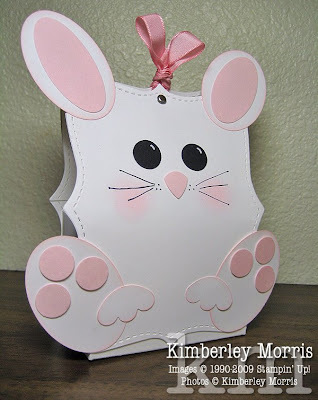 Then punch out a 1-3/8" Circle in Blush Blossom, and a 1/2" Circle in Blush Blossom. Sponge over the large circle lightly with Ruby Red ink--this circle will be the face, you are giving it a ruddy look. Sponge around the edges of the 1/2" circle with Ruby Red ink--this will be the nose, you are giving the outline some definition. Glue the 1-3/8" sponged circle onto the Ruby Red scalloped circle. (I like to use just a tiny bit of the Tombow Multipurpose Adhesive for glueing on this project.) Set the nose aside, you will attach it later. Punch the Tag Punch from Garden Green card stock, and trim it to 1" high. For the hat band, cut a strip of Basic Black card stock to 1/2" wide, then cut the strip to 1-3/8" long, which is the width of the tag punch. Glue the hat band onto the bottom of the trimmed Tag Punch, flush with the bottom. Then cut a 1/4" strip of Summer Sun card stock, and trim off a 1/4" piece from it, so that you have a 1/4" square of Summer Sun card stock. Glue that square in the center of the black hat band, flush with the TOP of the hat band. Glue the hat layers onto the top of the layered scallop circle. Imagine a line across the top 4 scallops of the circle, and line up the bottom of your hat layer just a little below that. Punch the hat brim from Garden Green card stock with the Large Oval punch. Take a bite out of the top and the bottom of the Large Oval with the Small Oval punch. You may wish to temporarily affix the Large Oval punched piece to a piece of scratch paper with Dotto, so you can more easily hold onto it while you line it up in your Small Oval punch. Affix one Mini Glue Dot to each side of the hat brim, on the back, and adhere it over the hat band. Make sure the black of the hat band does not show underneath the hat brim. Stamp two of the little round orange images from the One Smart Cookie stamp set, in StazOn Jet Black (or waterproof Basic Black) on Whisper White card stock, and allow to dry. Color over the center of the stamped images with an Old Olive marker, to make the green eyes. Trim out each eye with Paper Snips, and then affix each to the face, with a Mini Glue Dot. Affix the sponged nose, overlapping the eyes, with a Mini Glue Dot. For the mouth, you can punch out a 1" circle from scrap card stock (or vellum card stock if you'd like to be able to see through it), and use the piece with the hole punched in it for a guide. Trace around the inside of the punched hole with a Basic Black marker or journaler, to create the semi-circle smile. Mark lines across the smile at each end, and then use the marker to create a few freckles to each side of the nose. There's still time to order your supplies, just hop on over to my ONLINE STORE, or email me with your wish list! 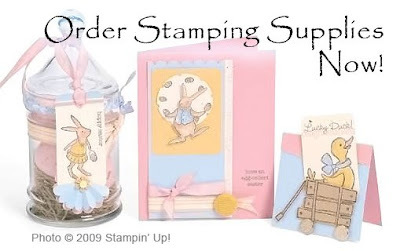 And remember, the Sale-A-Bration, and the Special Easter Stamp Sets are available through the end of March. 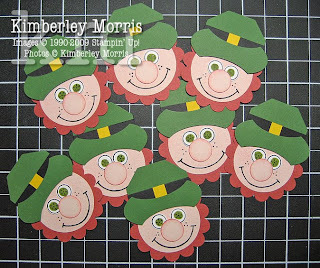 Order for St. Patrick's Day, and add on some Easter supplies, and get FREE stamps through the Sale-A-Bration promotion! 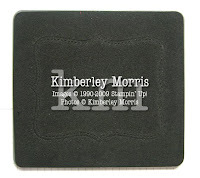 Click HERE to view, or right click to download, pictures of available stamp sets and wheel. 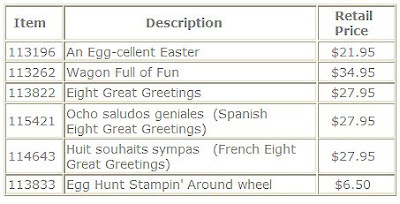 Eight Great Greetings (pictured below) is an extremely versatile set, covering all your springtime events, including Easter, Graduation, Mother's Day, and Father's Day. There's even a stamp to use for a shower--baby or wedding, and a stamp with two entwined hearts to use with wedding or anniversary wishes. The set is completed with images for thank you notes, and birthday greetings. 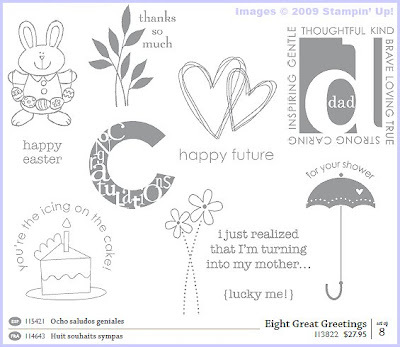 Eight Great Greetings, An Egg-Cellent Easter, and Wagon Full of Fun all include Easter images you'll enjoy using for years to come, and you can roll an easy background of eggs onto any card, treat favor cover, or scrapbook page with the Egg Hunt Stampin' Around wheel! Just bunny hop on over to my ONLINE STORE anytime to make your purchase! If you'd prefer to talk colors and accessories with a professional, drop me an email or call me at 719-205-5957 and I'll take care of you. REMEMBER: there is still time to take advantage of the Sale-A-Bration promotion--choose a FREE item for every $50 in product you order, through March 31st!